Idol statue bring prosperity and happiness in decor. Yellow dhoti with amazing creativity . Pearls studded with beautiful work. Best piece for gifting and decoration. Size of the product : 7"(L) x 3"(W) x 9" (H). This beautifully crafted multi-colour design all over the outer body makes sure that it is stand out among many other home decor things at home. Ganesha idol, our exclusive variety of marble handicraft products. Made by rural artisans of Jaipur, Rajasthan. Handmade work done on Makrana white marble and it is painted with style. 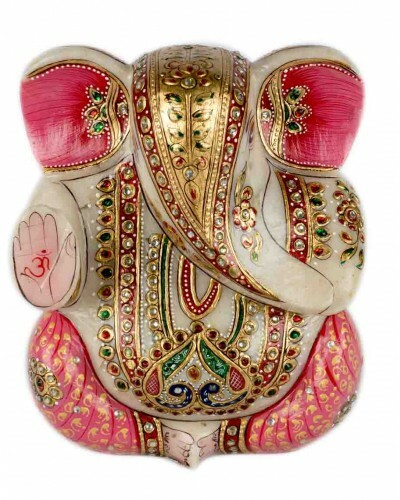 Stone studded on ganesha with elegant painting. Best piece for home decoration and gifting purpose.